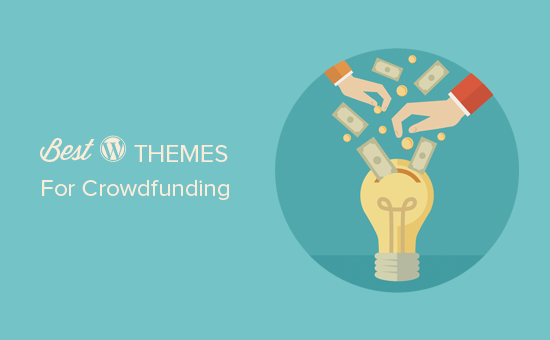 Are you looking for a WordPress theme for crowdfunding? Many WordPress themes are geared towards corporate or blogging websites and may not be a good fit to help you raise funds for your organization. In this article, we will share some of the best WordPress themes for crowdfunding and fundraising websites. Crowdfunding helps startups, charities, and individuals to raise money for their projects. It allows you to collect small contributions from individuals to reach your fundraising goals. 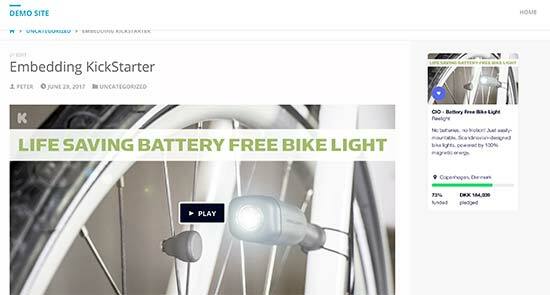 Many such projects use websites like Kickstarter to run their campaign. However, you will also need a website to better showcase your idea, mission, or cause. This is where WordPress comes in. It is the world’s most popular content management system powering almost 27% of all websites on the internet. A self-hosted WordPress site gives you the flexibility and freedom to easily integrate with all popular third party services you may be using for crowdfunding. To get started, you will need a WordPress hosting account and a domain name. This will be your website’s home on the web. We recommend using Bluehost. They are one of the largest web hosting companies in the world and an officially recommended WordPress hosting provider. Once you have signed up for hosting, you can move on to installing WordPress. Head over to our step by step guide on how to make a WordPress site, and you will be up and running in no time. Next, you will need to choose a theme for your website. You can select any theme from our expert pick below. 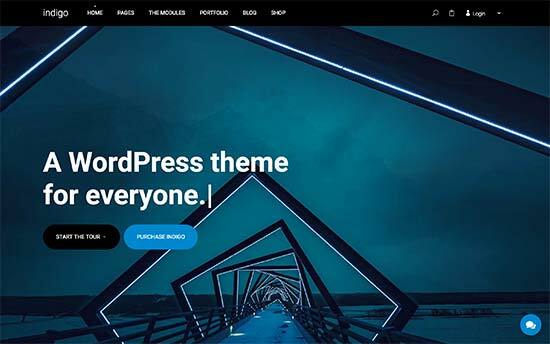 If you need help installing the theme, then check out our guide on how to install a WordPress theme. 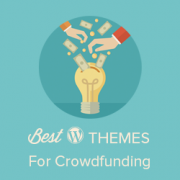 Having said that, let’s take a look at some of the best WordPress themes for crowdfunding. This list contains both free and paid themes, and all of them are mobile responsive. 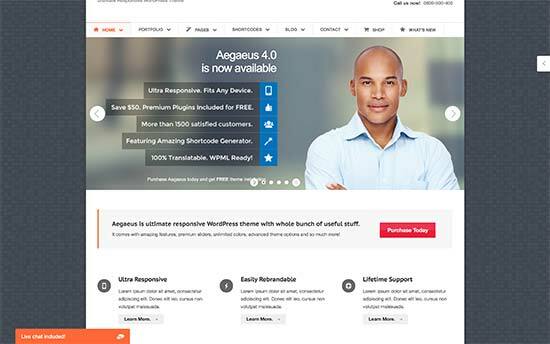 Aegaeus is a super-flexible WordPress multi-purpose theme that can be easily used to build engaging crowdfunding websites. It comes with a powerful admin panel and multiple layout choices. It also includes a ready to use landing page template. It ships with two WordPress sliders and a live chat plugin. Inside you will also find templates for contact form page, portfolio, staff members, testimonials, and tons of customization options. 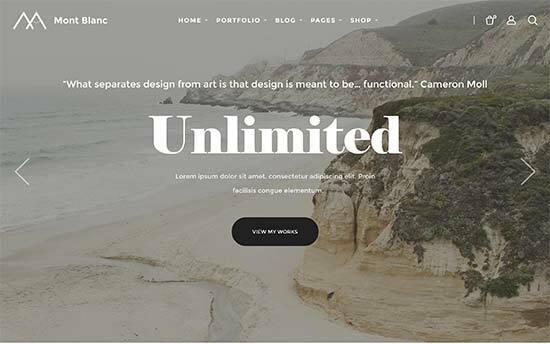 Atomic is a multipurpose WordPress theme perfect to build your crowdfunding website. It features a gorgeous homepage that helps you easily showcase your organization’s mission, projects, and people. 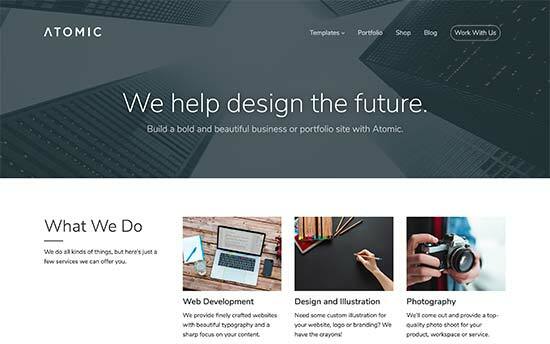 With beautiful typography and gorgeous display of images, Atomic makes each page on your website highly engaging. It offers a simpler theme setup with the help of WordPress live customizer. Inside you will also find a quick getting started guide to help you get up and running without struggling with too many options. 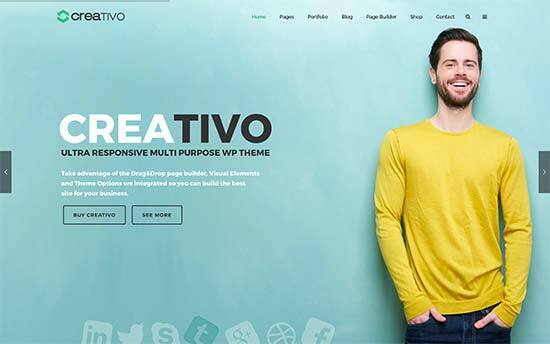 Creativo is a modern WordPress theme designed for any kind of business websites. It includes a customizable one page template which makes it an ideal choice for crowdfunding. It also ships with several readymade demos that you can install with 1-click and replace the content with your own. Inside you will also find portfolio content type, 7 skins, 3 design layouts, multiple header layouts, and unlimited color choices. It is eCommerce ready can be used to add an online store to your project. 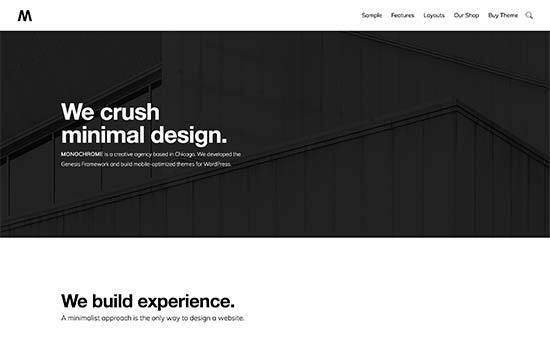 Monochrome is an ultra minimalist WordPress theme that is stylish and simple at the same time. It is built on the Genesis framework which provides it a rock solid foundation. It features a widgetized homepage layout which helps you easily setup your website. It also includes customizable header, theme options panel, 4 widget areas, and full WooCommerce support. 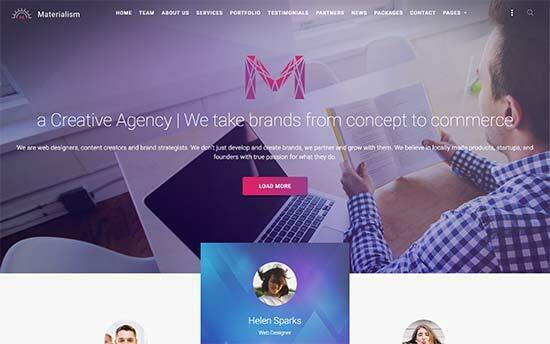 Martho is a beautiful WordPress theme suitable for crowdfunding creative projects and artworks. It includes built-in portfolio content type and beautiful portfolio display on the homepage in a grid layout. Despite its minimalist look, inside you will find plenty of customization options to make it uniquely yours. 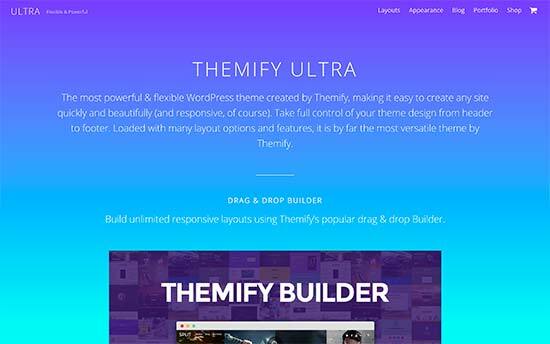 It has unlimited color choices, header styles, multiple layouts, and more. You will also get a premium drag and drop page builder plugin for free to create your own layouts. Need a modern look for your crowdfunding website? Check out Materialism. It has two homepage layouts with several engagement triggers like call to action buttons, promo block, subscription, contact form, pricing tables, and more. Inside you will also find multiple page templates, a blog page, social media integration, testimonials, and tons of customization options. Despite so many features, it is easy to setup and optimized for speed and performance. 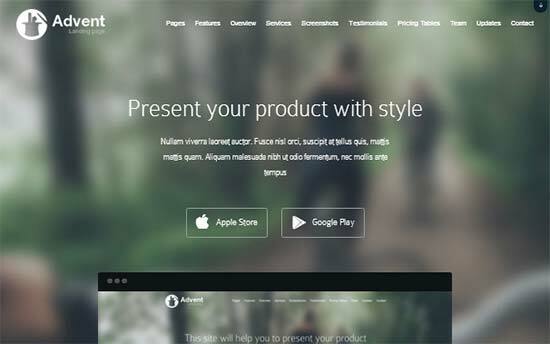 Struct is another modern WordPress theme perfect for crowdfunding. Designed for businesses and startups, it features a drag and drop homepage layout with a large full screen header at the top. It includes unlimited color choices, custom widgets, portfolio, photo galleries, projects, testimonials, faq section, and more. It also works with all popular page builder plugins so you can create your own page layouts if needed. 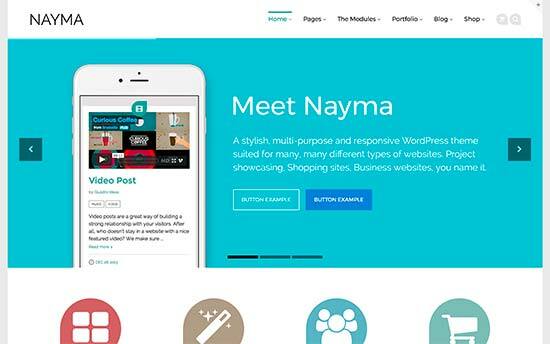 Nayma is a multi-purpose WordPress theme that can be easily used for crowdfunding projects. It uses modules as building blocks to create page layouts and has all the commonly used web elements available as modules. You can drag and drop them anywhere on your pages. It also includes several readymade websites that you can use as an starting point. It has unlimited custom sidebars, sliders, icon fonts, Typekit font support, testimonials, pricing tables, contact form, and more. 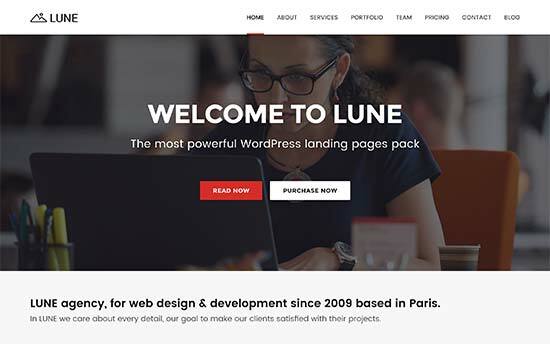 Lune is a highly flexible WordPress landing page theme with built-in demos for startups, agencies, apps, and product landing pages. It comes with a 1-click demo installer that allows you to use any of the readymade landing pages on your site instantly. It also includes 10 header and 7 footer styles, many drag and drop sections, photo galleries, sliders, custom widgets, and tons of other customization options. A page builder plugin is also included, so you can make custom page layouts. Montblanc is another powerful WordPress theme with flexible customization options. It can be used as a one-page or multi-page theme and comes with built-in sections for your portfolio, team members, testimonials, clients, and galleries. Montblanc also includes several layout choices, page templates, custom widgets, and social media integration. It is also eCommerce ready with full WooCommerce support. It can also be used with popular WordPress membership plugins. 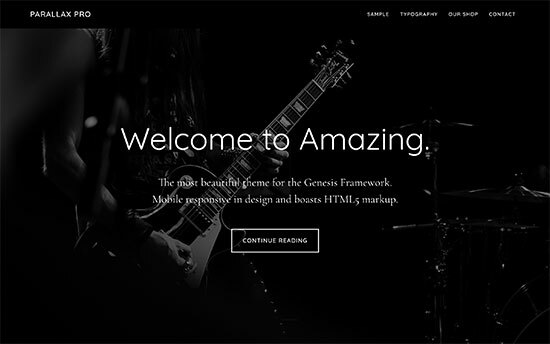 Built for Genesis theme framework, Parallax Pro is an elegant WordPress theme suitable for crowdfunding, landing pages, and sales page websites. The homepage features a large fullscreen header with prominent call to action. It has a widgetized layout allowing you to setup homepage using drag and drop content widgets. 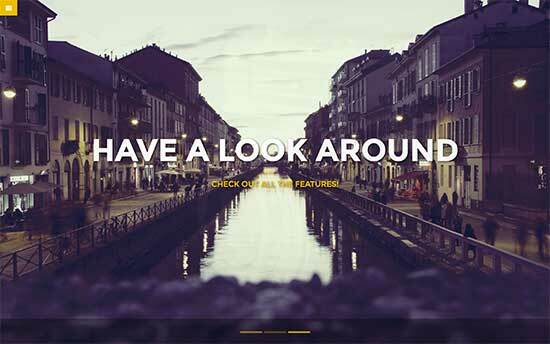 It uses beautiful parallax effects to create an engaging experience for your users. It is WooCommerce ready and comes with a simple theme options panel and live customizer support. Propel is a multipurpose single page WordPress theme ideal for building a crowdfunding website. The homepage features beautiful parallax effects and animations to create a better user experience. It can also be used as a multi-page WordPress theme and has templates for blog, archives, and other pages. It has a filterable portfolio section that uses Ajax and CSS animations. It also includes a custom Twitter widget, icon fonts, unlimited colors, and contact form. 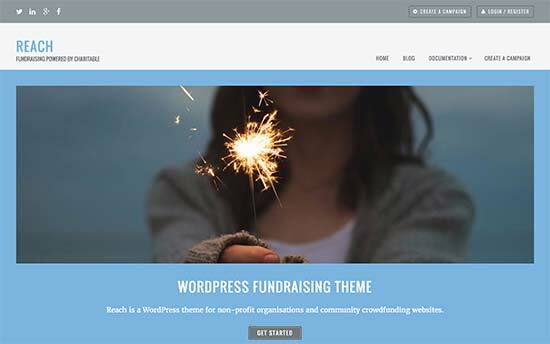 Reach is a free WordPress theme for charities and non-profits to create crowdfunding websites. It features a simple layout designed to showcase your cause and encourage donations. It has simpler theme customization options which can all be accessed using live theme customizer. You can change header image, background colors, and add social media links. Due to its dynamic flexibility Ultra can be the perfect fit for your crowdfunding efforts. It ships with several readymade websites that can be installed with 1-click. You can then replace the content with your own to create instant websites. It ships with an integrated drag and drop page builder which allows you to create beautiful page layouts of your own. Inside you will also find sections to add portfolio, photo galleries, testimonials, events, and more. 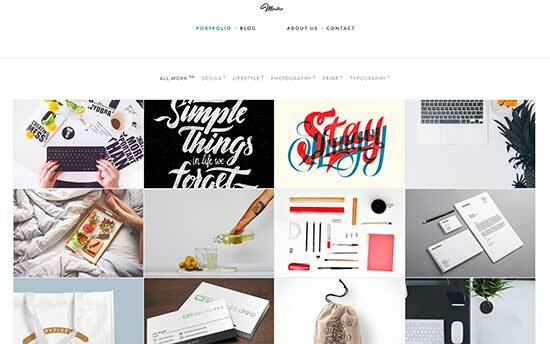 Inspiro is another great choice for a WordPress crowdfunding theme. 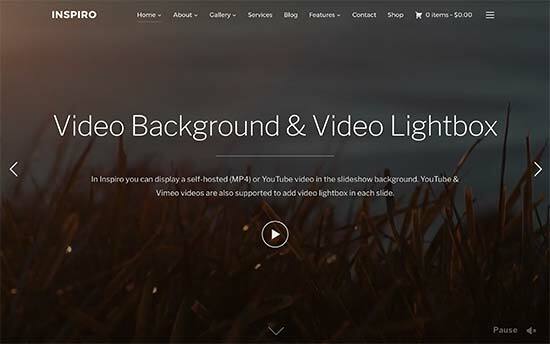 It comes with built-in support to easily add self-hosted or YouTube videos as fullscreen background as a slideshow on top. It also includes a beautiful video lightbox popup for an engaging viewing experience. Inspiro has a drag and drop homepage layout and offers integration with a free page builder plugin. Other notable features include page templates, portfolio section, hero banner, gallery templates, custom widgets, and full WooCommerce support. 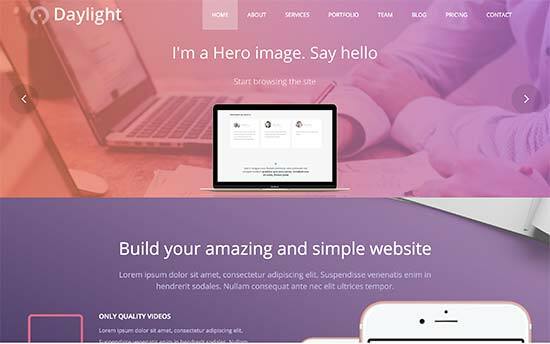 Daylight is an ideal WordPress crowdfunding theme for tech startups, small businesses, and non-profits. It comes with two homepage layouts, 10 pages, multiple header styles, and widget ready areas. It can be used as a single page theme or a multi page WordPress site. Inside you will also find a social media widget, portfolio, testimonials, contact form, Google Maps, and more. All theme options are easy to setup and 1-click demo content installer is also available for quick start. 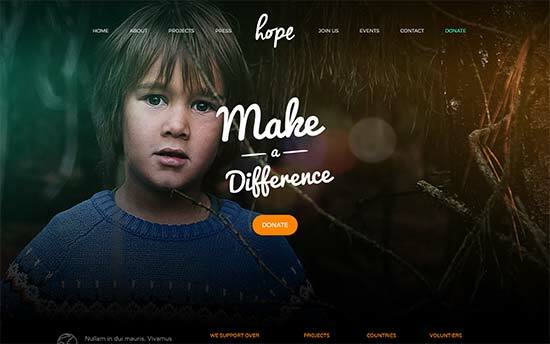 Hope is a WordPress theme for charities and non-profits perfect for crowdfunding and fundraising activities. It has three slider layouts, 1-click demo content installer, and drag and drop page builder. It also has support for popular WordPress plugins for non-profits. Other features include multiple color schemes, event management, multiple layouts, and social media integration. It can also be used to create multilingual WordPress sites with WPML. 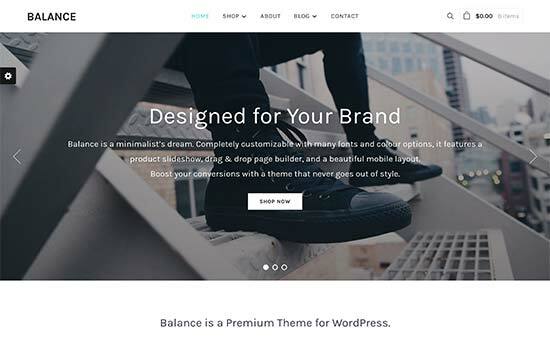 Balance is a WordPress business theme designed to put your brand in the center. Perfect for a crowdfunding website, Balance comes with a modern and stylish homepage layout which allows you to feature your projects and boost your conversions and supporters. It is eCommerce ready and has beautiful templates for shop and product pages. Other features include multiple blog styles, 6 color schemes with unlimited customizations, Instagram widget, custom fonts and logo. 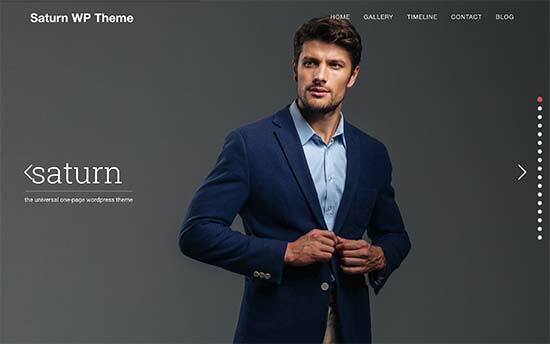 Koehn is a multipurpose WordPress theme in the minimalist design tradition. It uses lots of empty space and has breezy layout which makes all your content appear more prominently. A simpler theme options panel makes set up process hassle free. The homepage can be setup by simply adding content widgets to create your page layout. It also includes custom widgets for Twitter, Instagram, social media integration, and content discovery features. 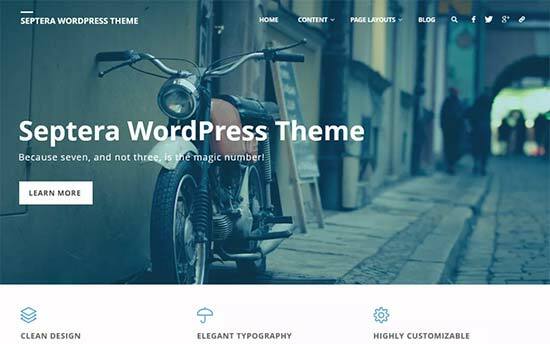 Septera is a stylish and free WordPress theme for business websites. It is easy to setup and features beautiful typography, elegant design, and a simpler theme setup. It supports custom header, background, post formats, and has different page templates that you can use. It is multilingual ready, with RTL language support, and the theme itself is translation ready. Advent is a sleek WordPress theme for mobile apps or any other product website. Its homepage features prominent call to action buttons on top of a fullscreen background image. Followed by features, testimonials, pricing tables, and other content blocks which you can simply drag and drop to arrange your page layout. It also includes magnifying glass feature for product images, sticky menu, social media integration, icon fonts, and custom widgets. It can be used on multilingual sites using WPML. Indigo is a stunningly beautiful and very easy to use WordPress theme. It is designed to be a multipurpose theme allowing you to choose your own layouts and styles without writing any code. It includes several readymade websites that you can install with 1-click to import complete demo content. If you don’t want to start with a readymade website, then you can just drag and drop modules to create your own layout. It features beautiful typography, stunning templates for galleries, portfolio, services, testimonials, and many more customization options. 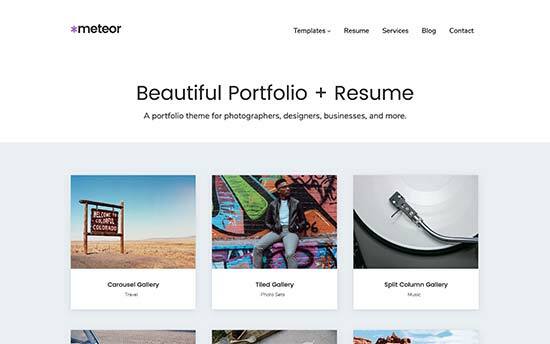 Meteor is a WordPress portfolio and resume theme that can be easily repurposed to promote any crowdfunding project. It has masonry, grid, blocks, and carousel layouts for your portfolio page. Each portfolio item has its own template and you can add as much detail as you like. It has a centered single post layout suitable for long form articles on your site. Other notable features include beautiful photo galleries, crisp typography, and a better user experience on mobile devices. 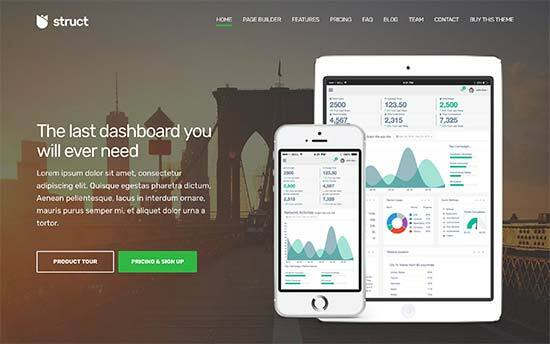 Saturn is a highly flexible WordPress theme for any kind of business. Saturn is ideal for any kind of crowdfunding project due to its engaging one-page layout. 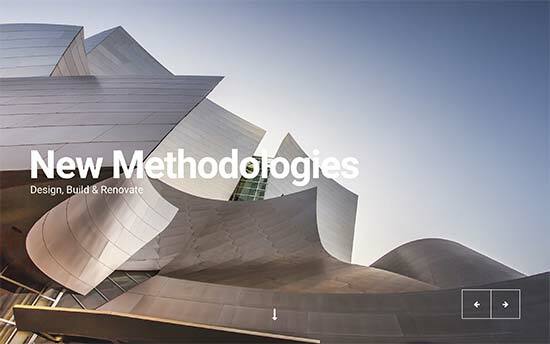 The homepage features parallax background with beautiful effects, filterable portfolio displayed in a masonry grid. It ships with a slider plugin, 1-click demo installer, Google Maps, Google Fonts, icon fonts, and more. It can also be used as a multi-page theme and you can add a separate page for blog posts as well. How you run your crowdfunding campaign in WordPress depends on what platform you are using to raise funds. We will show you a couple of them to help you get started. If you are using Kickstarter, then first you will need to visit your Kickstarter project page. On your project page, click on the share button and then select the Embed option. This will bring up a popup with two different embed types. You need to copy the code for the embed type that you want to add. 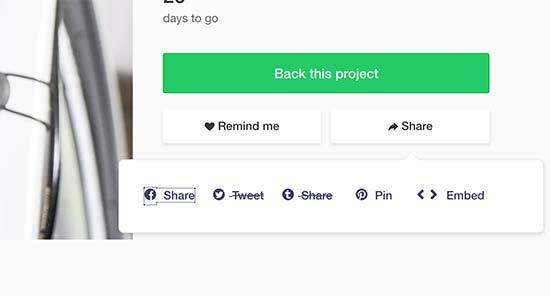 Now you need to edit the post or page where you want to display your Kickstarter project. You can also add it to a text widget in your sidebar. Before adding the code, don’t forget to switch to the text editor mode. Paste the embed code and then save your post, page, or widget. You can now visit your website to see it in action. If you are fundraising for a non-profit cause, then you can use PayPal to accept payments directly on your website. To create a beautiful donation form, see our step by step guide on how to create a donation form for nonprofit organization in WordPress. Most people visiting your website will probably leave without supporting your project or donating to your cause even if they support it. The best way to keep those users engaged is to start building your email list right away. You will need to sign up with an email marketing service and use a lead generation software like OptinMonster. OptinMonster helps you convert abandoning visitors into subscribers. This allows you to keep those users engaged and eventually convert them into a customer. That’s all for now. We hope this article helped you find the perfect theme for your crowdfunding project. You may also want to see our ultimate step by step WordPress SEO guide for beginners. Is there any free theme ?